Robinair’s 14777 electronic vacuum gauge is just 2-1/2" x 3" in size, but accurate enough to clearly indicate when the system is free from moisture and ready for recharging. Specifically designed for use with a high vacuum pump, the 14777 measures to 10 microns. Clearly Shows Vacuum Level – The display is an easy-to-read LCD type with readout showing the current vacuum level. 6' Lead for Service Flexibility – Hang the gauge in a location that’s convenient for you to monitor vacuum level. Moisture in an A/C system is a serious problem for the technician – it causes freeze-ups and corrosion, seriously damaging the A/C system. The most effective way to eliminate moisture is to create a vacuum deep enough to boil it away. For that, you need a high Vacuum Pump, and a tool to tell you when the vacuum is deep enough to adequately dehydrate the system. Without a means of measurement, evacuation time is based on guesswork. The length of time required for thorough dehydration will vary from system to system because of several factors – so using a clock isn’t foolproof. You risk not removing all the moisture – or wasting time by running the pump long after evacuation is complete. 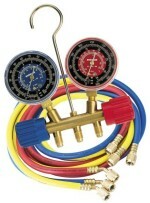 Many service technicians rely on the compound gauge of the Manifold to read vacuum. While the manifold is good for gross measurements, it’s simply not accurate enough to determine exact vacuum levels. It’s designed to read low pressures in inches of mercury, but there’s no way to read exact levels when you’re pulling the last, most critical inch of vacuum. If you look at the compound gauge face, you can see that it’s not possible to clearly differentiate between 29" Hg and 29.9" Hg, for example. But in microns – the precise measurements for the last inch of vacuum – that’s the difference between roughly 23,000 and 250 microns. A closed-end, U-tube, mercury manometer is capable of reading to 500 microns. 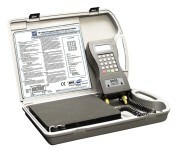 However, it’s a delicate instrument, more suited to a laboratory or controlled environment. The most economical, effective, and easy-to-use option is an Electronic Thermistor Vacuum Gauge. It eliminates the guesswork by measuring the vacuum to precise micron levels, ensuring the system is leak-free, moisture-free, and ready to be recharged. Although originally developed as a laboratory instrument, today’s thermistor vacuum gauges are rugged enough – and reliable enough – for field service work.